We attended the press preview early this week during which Senior Curator of Photography Clément Chéroux led us through the seven-room show. 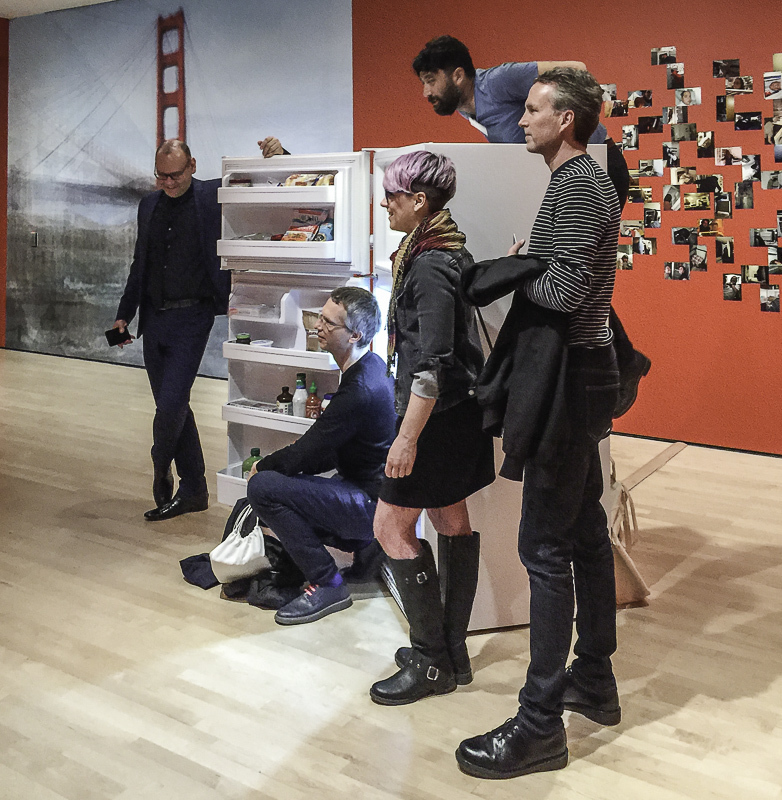 He was assisted by Linde Lehtinen, assistant curator of photography, and Sally Martin Katz, curatorial assistant of photography. 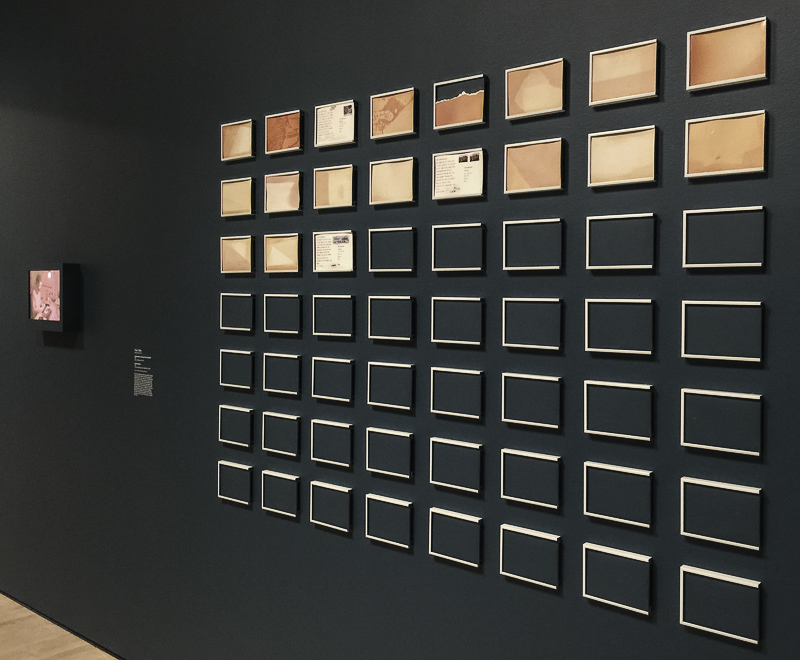 There was a lot to see, including the work of over 20 international artists, just a few of which we'll highlight here. But there was plenty to do, too. 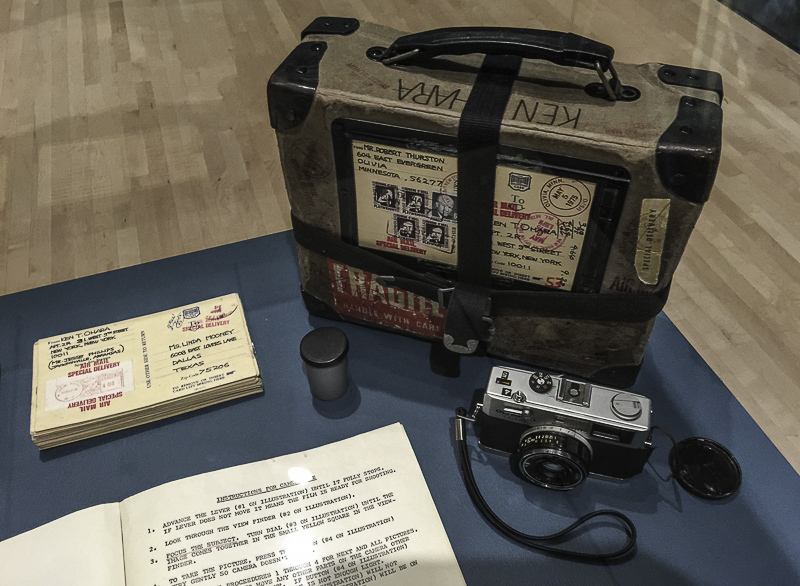 It's an interactive exhibit where photography is encouraged and, consequently, sharing too. 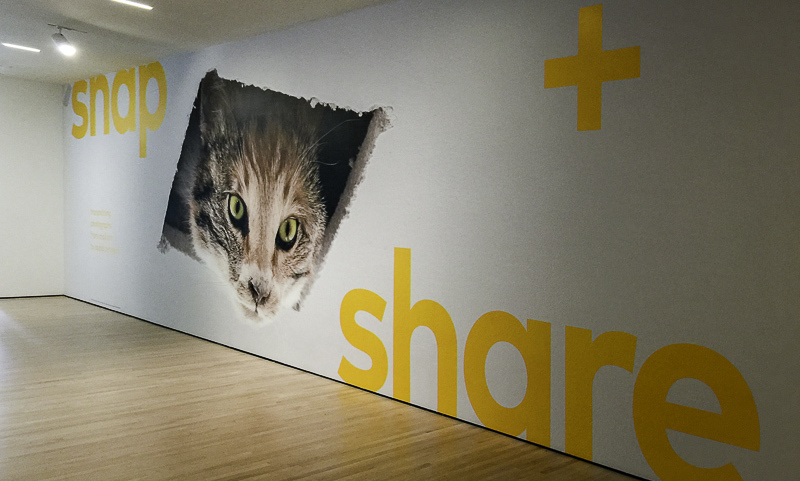 Chéroux pointed out that sharing photographs has a long history, well established during the analog era. And it is exploding in the digital era. You already knew that, we suspect. 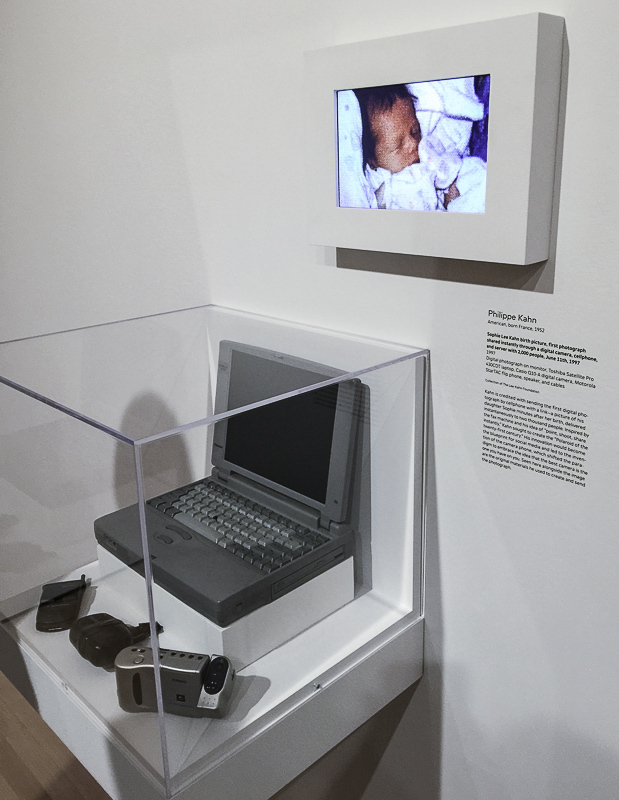 In the first room, the two eras are introduced with the display of a UPI wirephoto transmitter from the 1970s (spinning wildly as it scans a black-and-white print) next to Philippe Kahn's digital image of his daughter Sophie (which we've previously discussed in Matinee: '1997: The Birth of the Camera Phone'. But the room is otherwise dedicated to illustrated postcards as far back as the 1880s. 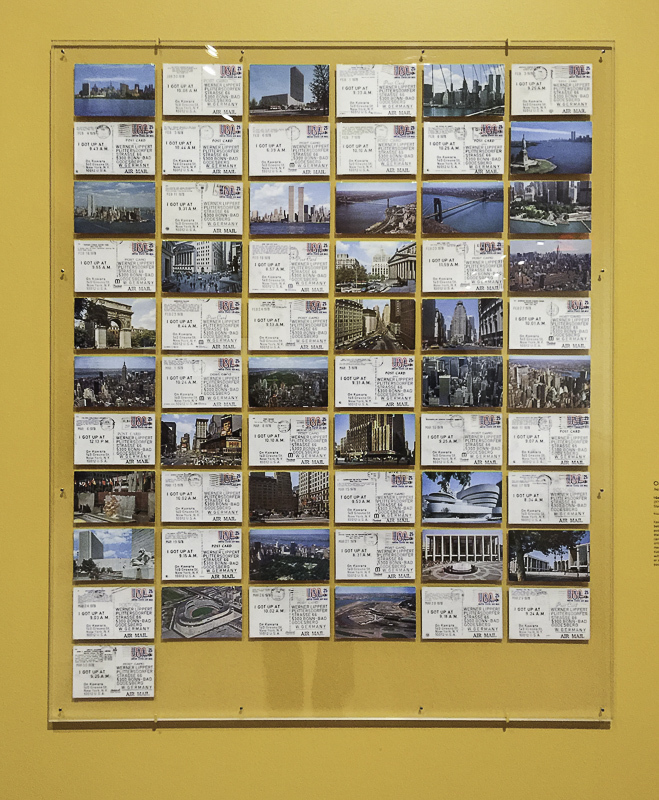 It includes postcard prints (one by Walker Evans from Havana, in fact) and On Kawara's series I Got Up... of stamped ink on postcards reporting what time of day he arose. 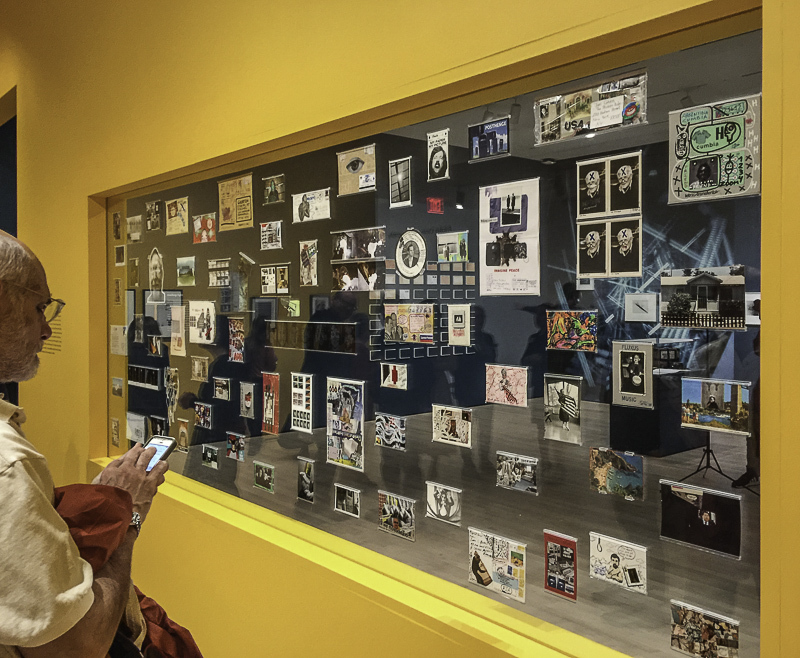 A window wall shows both sides of less famous if still creative attempts to share images through the mail. Leaving the yellow room, we enter the blue one of more intentional artistic efforts. 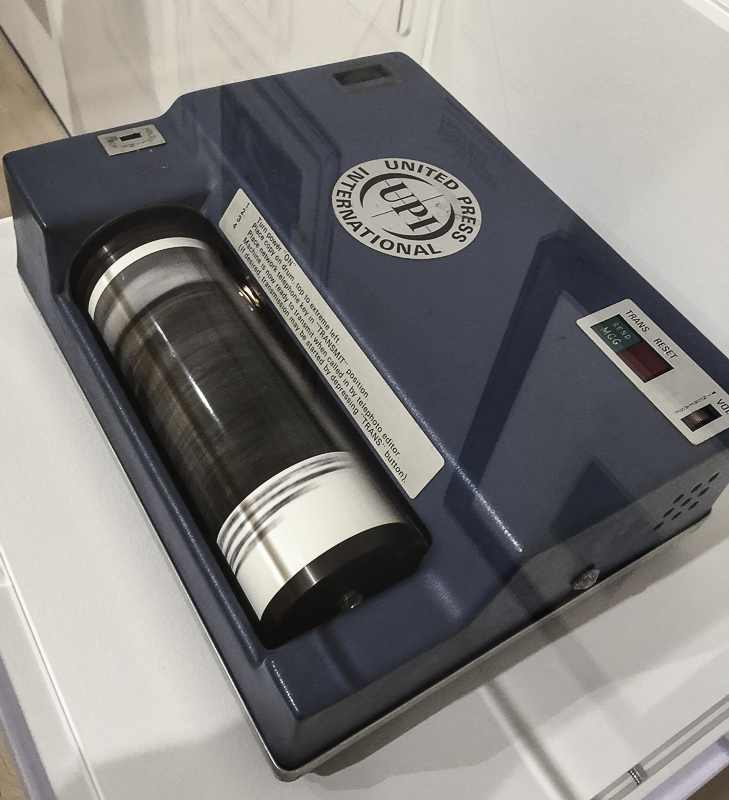 There is a short repeating video of Peter Miller typing an address on a postcard made of undeveloped paper, recording light during the journey from Europe to SFMOMA. He'll be sending one twice a week during the exhibit. 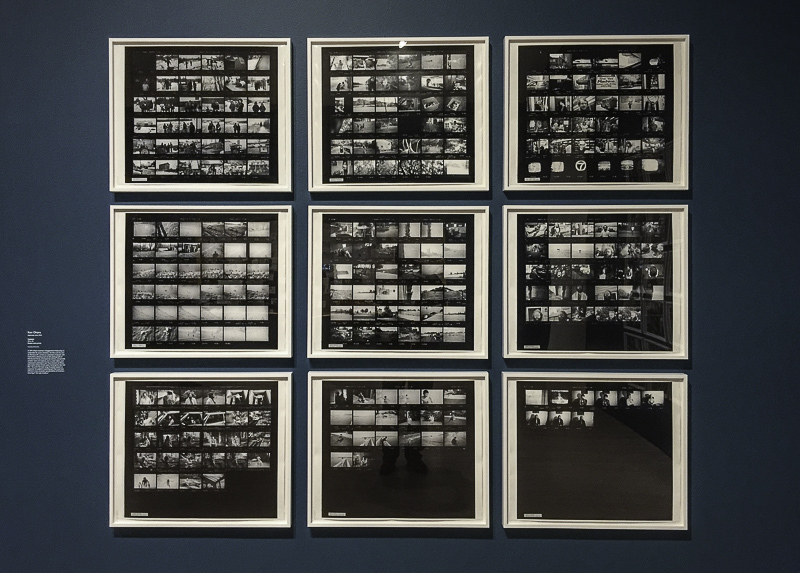 There are also nine enlarged contact sheets of Ken Ohara's Contacts project in which he sent an Olympus camera to various strangers with instructions for shooting a roll of film to be returned to him. 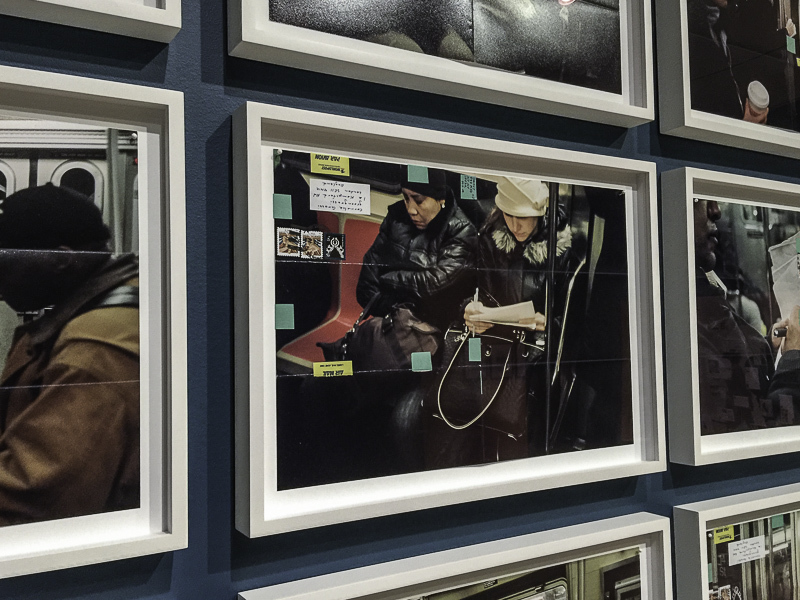 Moyra Davey's 2011 series Subway Writers I is represented by 25 framed color photos of people writing on the subway which had been folded and mailed. The fold lines as well as the tape she used are clearly visible on the framed prints. 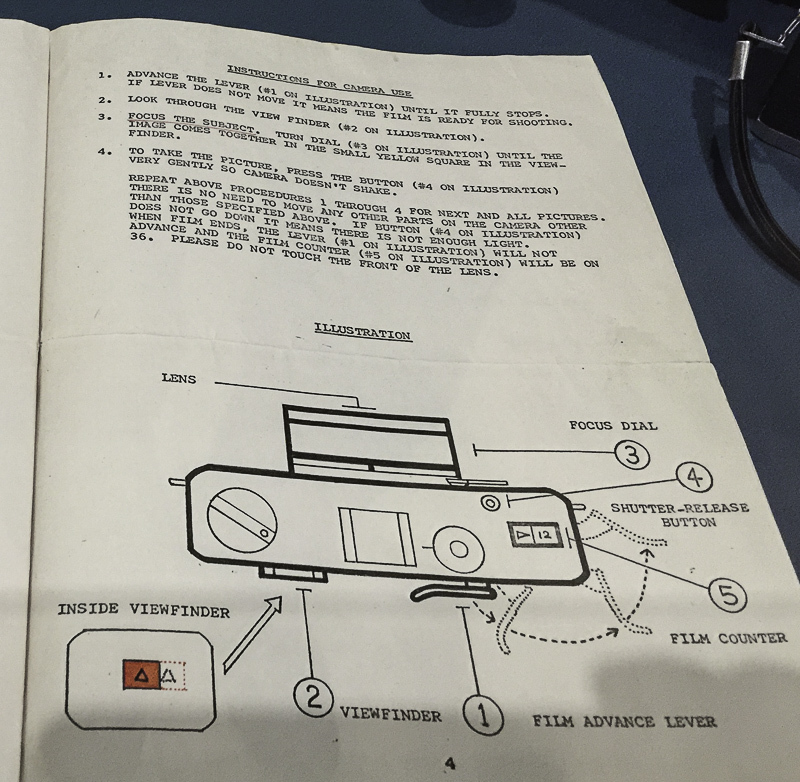 That takes us through the analog age. 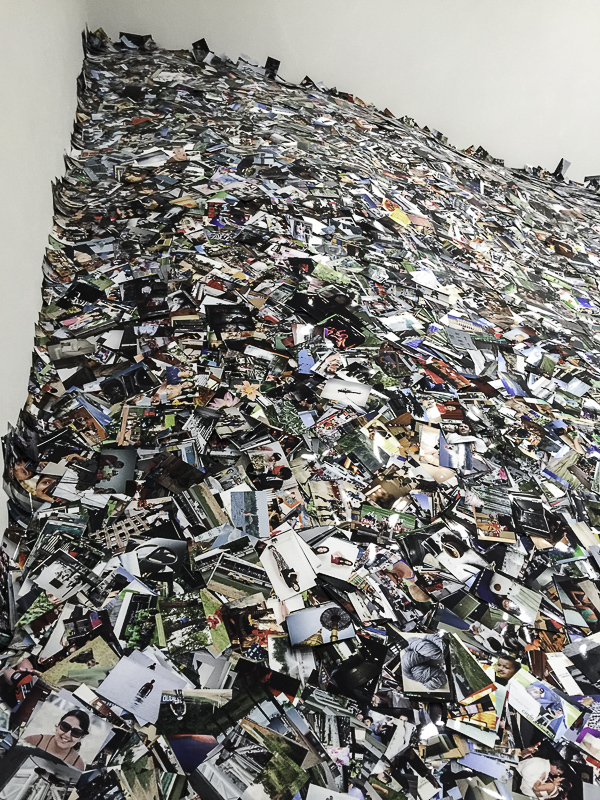 We transition to the digital era by following a path through two mountains of prints designed by Erik Kessels called 24HRS in Photos. 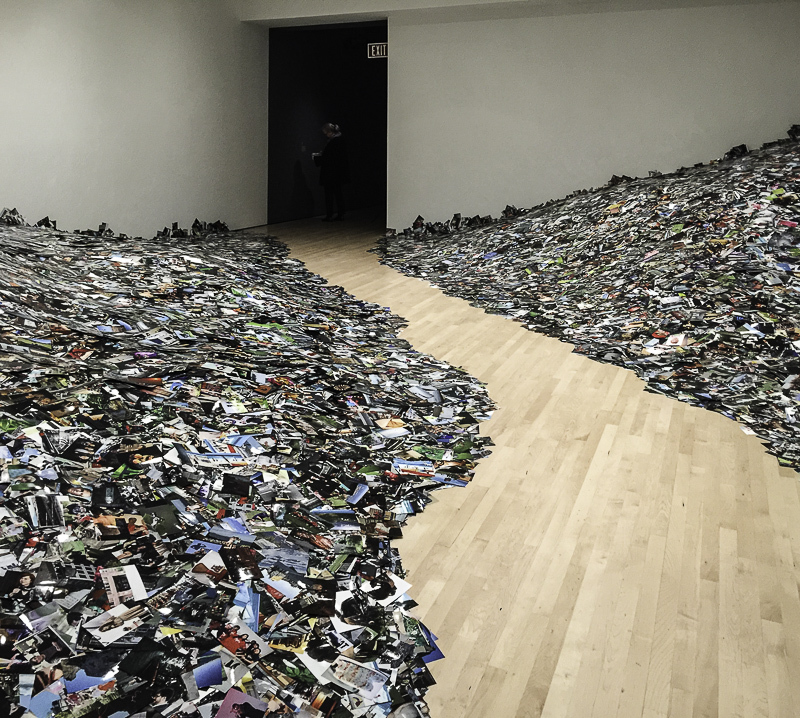 It's composed of actually 350,000 prints assembled on an undulating structure. It took about a week to put together Lehtinen said. And that leads to a darkened room with a huge see-through projection screen hung diagonally across the floor and suspended from the ceiling on which Jeff Guess's Addressability is playing. You can see the show on both sides. Guess's custom software assembles an image from all of the latest selfie uploads on Twitter, each one part of the mosaic. 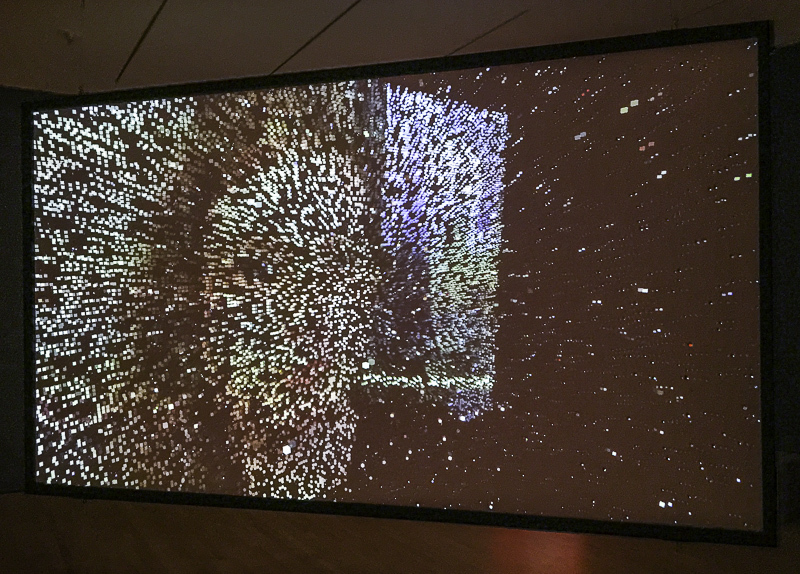 When the images is complete it explodes and immediately the software begins assembling the next one. The motion of pieces flying out and being assembled never stops. 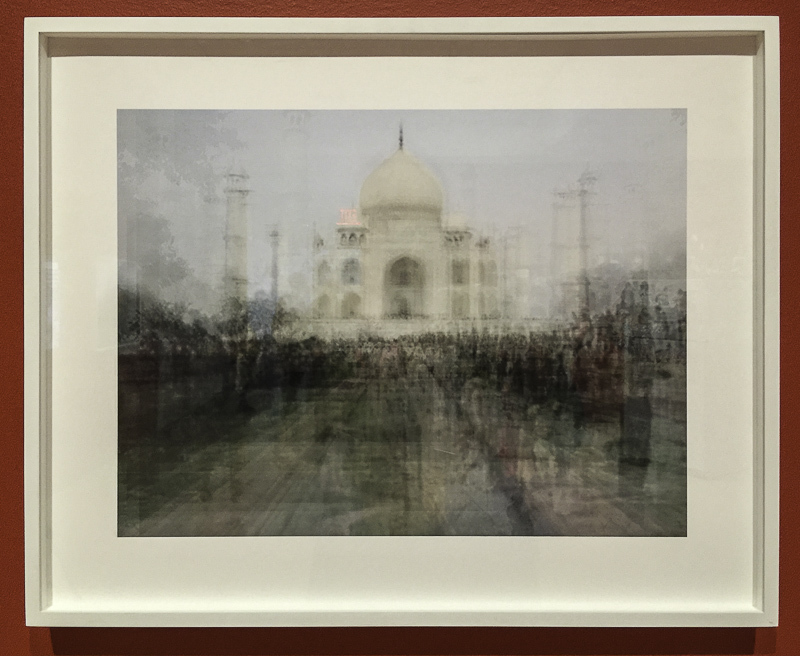 We escape that mesmerizing experience to enter the red room where Corinne Vionnet's series Photo Opportunities is represented by several inkjet prints depicting composites of photos found on the Internet taken by various tourists of famous sites in Beijing, Paris, Agra and San Francisco. 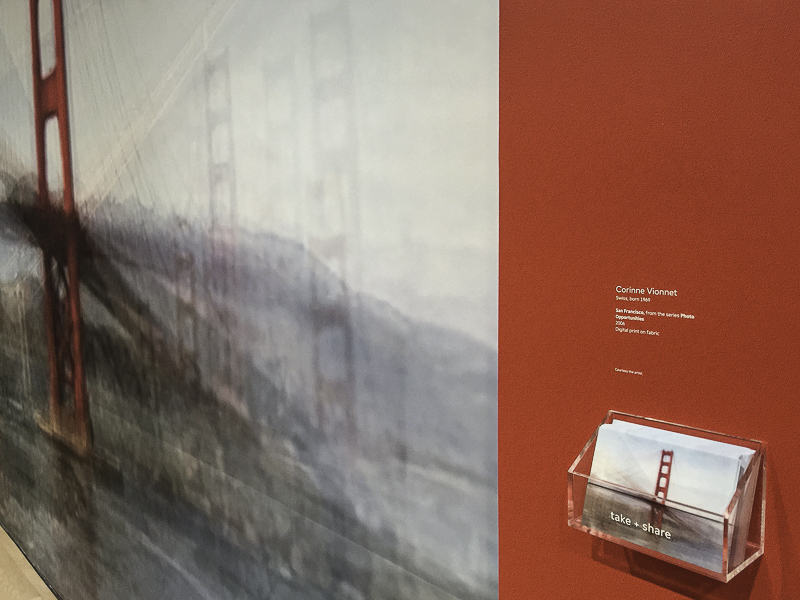 With the composite of the Golden Gate Bridge, the interactive part of the exhibit comes into play with the invitation to take a postcard of the image and share it. 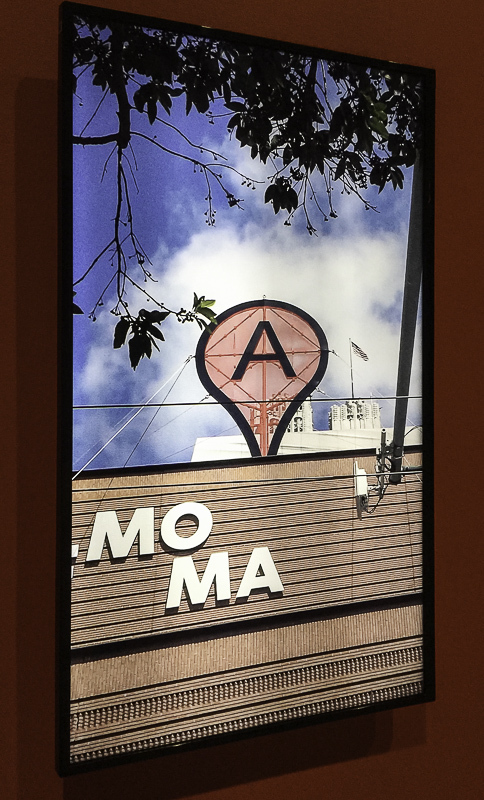 Aram Bartholl's Map is documented on an adjoining wall in video and with stills showing the installation of his 30-foot tall pin on top of the museum, confusing the online representation of location with the reality. 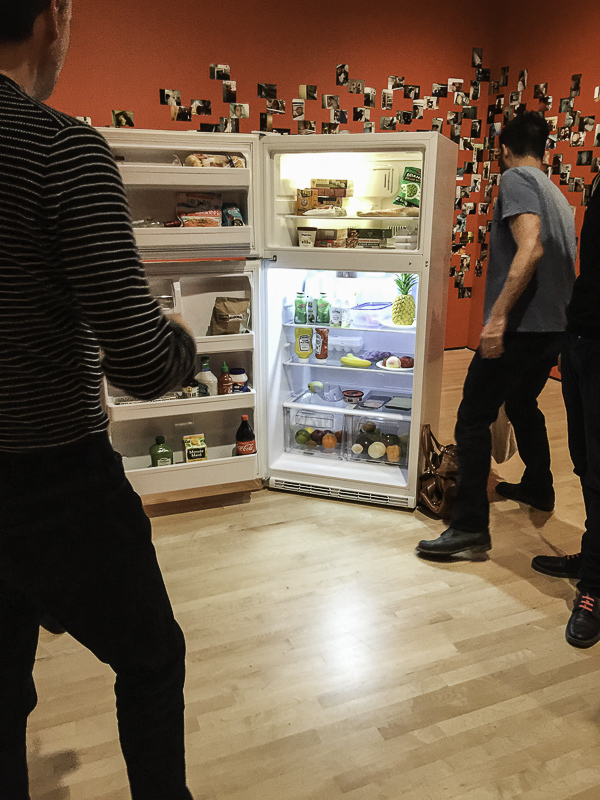 But you can't miss David Horvitz's 241543903, a refrigerator in the middle of the room which invites you to "Take a photograph of your head inside a freezer. Upload this photograph somewhere on the Internet using the tag #241543903." 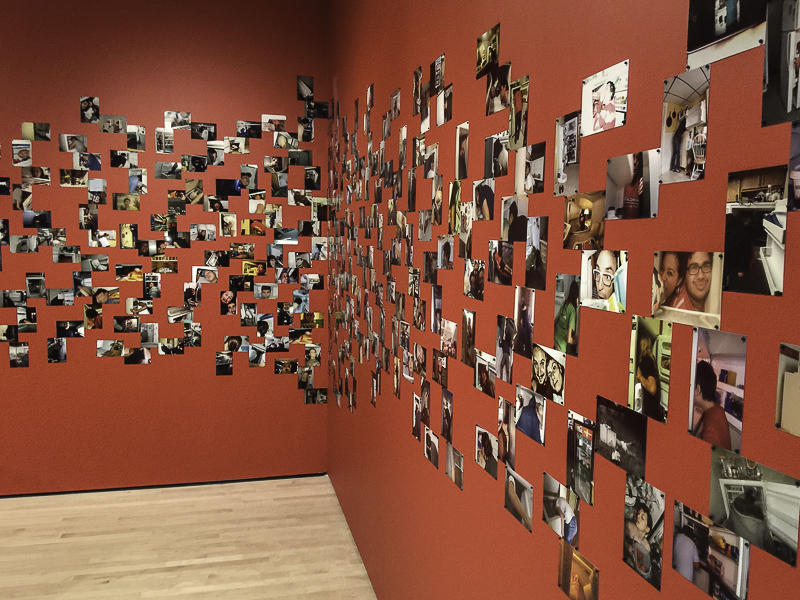 Two walls are covered with prints of people who have done just that. And during the exhibit you're invited to join them. 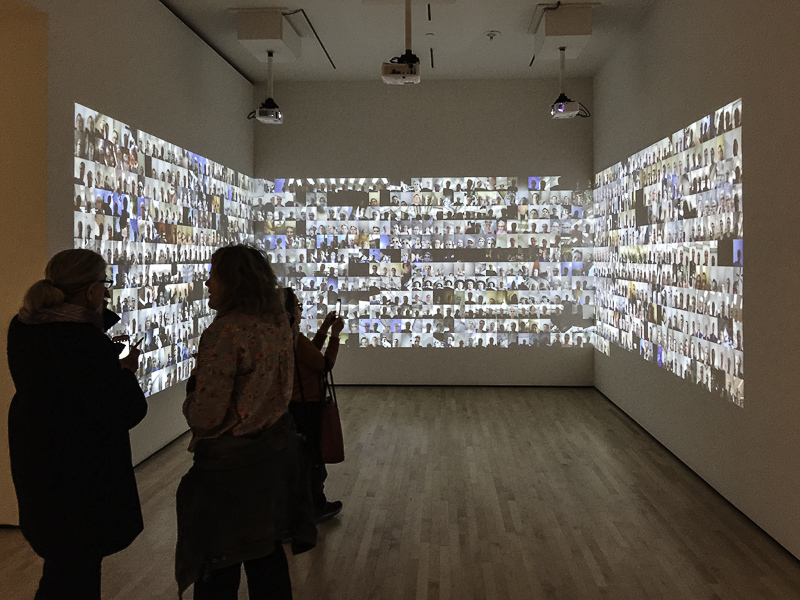 Leaving the red room, you enter a white room showing Kate Hollenbach's phonelovesyoutoo, a series of videos (over a thousand of them) of her looking down at her phone as she sends texts, reads articles, uses GPS and answers email. The final room is just adjacent, also white, with a little placard that advises you to look up. 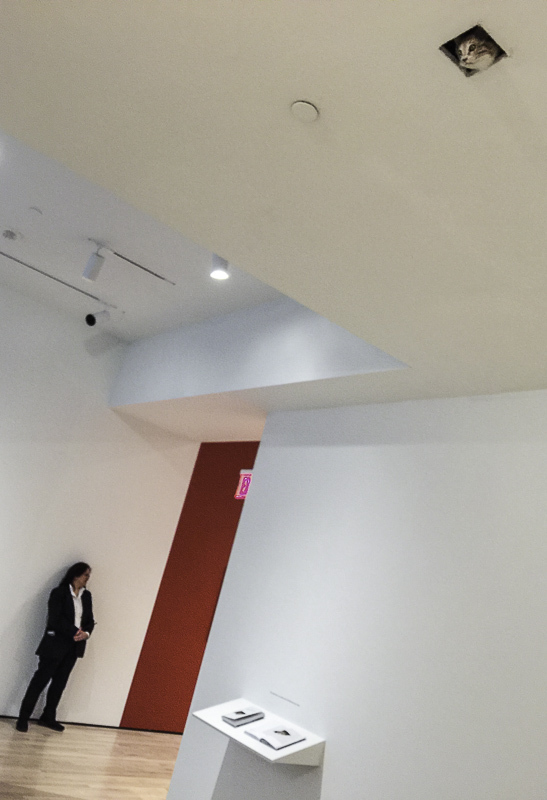 "See the artwork in the middle of the ceiling in this gallery. Photographs are not only permitted by encouraged!" When you look up you'll see Eva and Franco Mattes's Ceiling Cat inspired by the "Ceiling cat is watching you" meme of 2006. Which, all fun aside, is how you can tell it's time to leave.